I received the products in this post free from Oriental Trading. Easter Sunday is almost here, April 16, 2017. Easter is a fun holiday filled with colored eggs, chocolate rabbits, real live bunnies and a Lamb. Yes, Jesus is who makes Easter special! You may be starting to think about what you'll get the kids and how you'll decorate. I've put together 3 Tips to make your Easter Easy by using products from a trusted friend of mine, Oriental Trading. Tip #1: Use Filled Easter Eggs for your Community Easter Egg Hunt. Every year our church requests plastic eggs and candy for the hunt. Then, they ask for volunteers to pull the eggs apart and insert the candy. I got smart and you can too! I'm donating these beauties that accomplish many goals including presenting the resurrection story with the colorful wording on and inside the eggs. Easy? I think so. Tip #2: Easter pencils are an easy and useful addition to any Easter Basket. Kids love pencils! They can never have too many. These religiously decorated pencils are eye-catching and also remind children what Easter is all about. Jesus lives! Tip #3. Decorate your space with colorful yard signs. These signs are well constructed with a laminated front and two stakes per sign. Super easy to beautify your landscape for Easter and share the Good News of the gospel. Very visible from a distance too. Enjoy your holiday. Be sure to check out all these Easter items on sale now. Buying in bulk is one more way to save money and make your Easter easy. 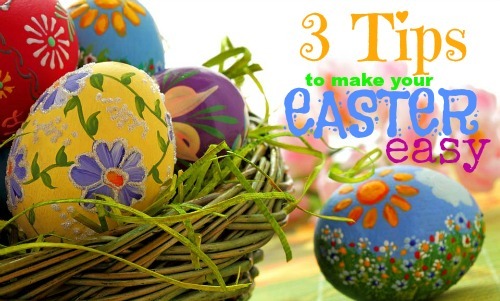 Please share these 3 Tips to make your Easter Easy with your friends and make their Easter easy too!